One of the first things you notice in this bustling city is that the streets are covered with electricity and phone cables making everything look cluttered. I was quite amazed that people don’t shock them selves and that there aren’t constant electrical fires breaking out all over the city. It looks like every inch of the city has been built on. The only place you can find greenery is in the few parks dotted around the city and on people’s roofs, which they turned made into rooftop gardens. Most buildings are at least 3 levels high but only one room wide. The only windows in the house are usually on the front or at the back if you are lucky and it is not too tightly squeezed against your neighbours. But the ceilings are quite high and thanks to this the rooms feel quite spacious and not too hot in the summer. When you walk around town it’s like being on a survival course. First you have to dodge vendors trying to sell everything from copied books to old war Zippos. 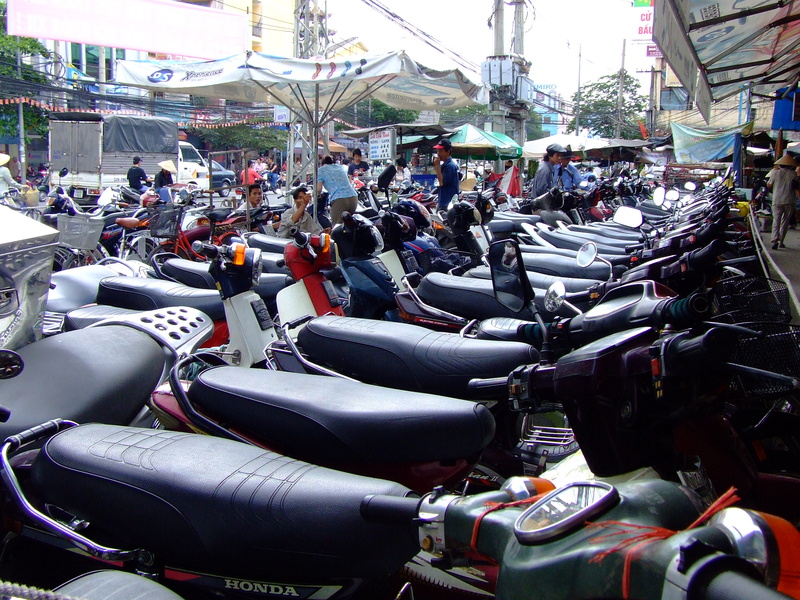 Then there’s all the motorbikes that cover the sidewalks using it like a parking area and if you step into the street to walk around them you can and probably will get hit by a motorbike or bicycle carrying up to 5 people at once!! 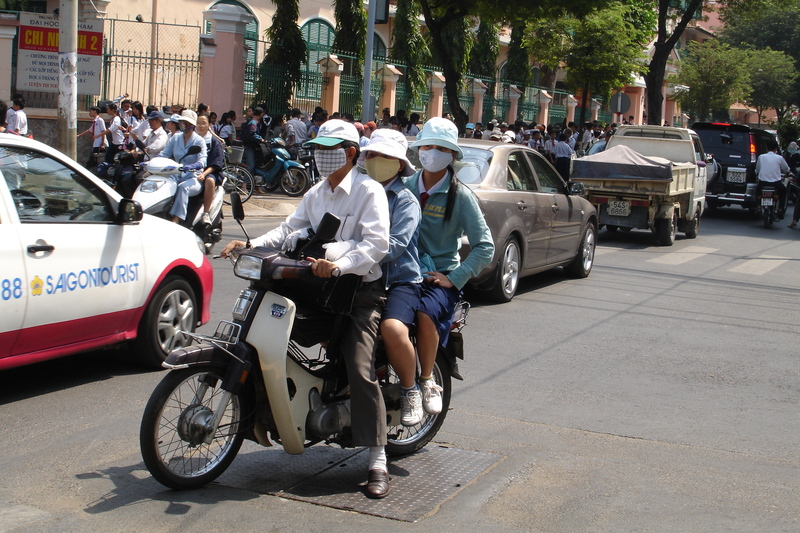 The norm is up to 3 people on one motorbike! You absolutely got the taste of this city. nice and clever composition for the pics makes the post lively and refreshing…i liked it. Love they way you review the city, and those pictures are the proof :)) Have to say that reminds me of some cities I have visited in Indonesia..but the five in one back is a record I have ever seen! Thank you! I was quite lucky to get a photo of them and never again saw 5 on a bike although I did get to see some other strange things being transported by motorbike. It certainly looks well kept. There I cant disagree, it looks quite clean but the motorbike filled streets and all the electrical wires everywhere creates quite a chaotic feel once you are in the midst of it.